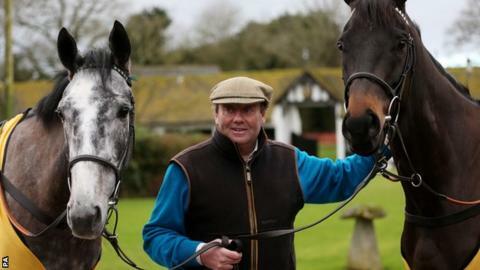 Trainer Nicky Henderson has described Saturday's Betfair Hurdle at Newbury as "a legendary race" as he bids to add to his five previous victories. The race, which offers prize money of £88,000 to the winner, will have Sign Of A Victory and Vasco Du Ronceray from the Henderson stable. "It's the best track in the country in our opinion," Henderson, 64, told BBC Radio Berkshire. "It's our local track and it's always been a legendary race." Henderson has triumphed in the past with Sharpical, Geos (twice), Landing Light and most recently in 2013 with My Tent Or Yours. "It's very valuable and everyone wants to win it," he added. "There's not much point in coming otherwise. "They've got to be realistic contenders otherwise it's a waste of a race and a horse. It's a tough race." Sign Of A Victory will carry top weight, with the six-year-old having won a Listed race on good ground at Ascot earlier in the season - but he could only finish fourth behind Faugheen in the Christmas Hurdle at Kempton in his only outing since. The horse's connections would prefer good ground but have declared for the Betfair Hurdle, with Barry Geraghty in the saddle, partly because of a lack of alternative races. "We decided we may as well find out once and for all about the ground in a race such as this," said owner Matt Morgan.